A simple method of Colour mixing will be explained and practiced. This method can be used for oil and acrylic but the tutor will be painting with watercolour for ease of use. 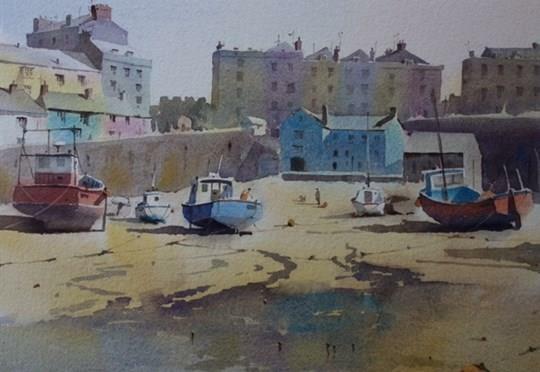 Peter has been teaching the craft of watercolour and drawing for some years now. He is a self taught artist and believes this to have benefited his ability as a tutor. He is an elected member of The Royal Society of Marine Artists, the Royal watercolour Society of Wales and the Pure Watercolour Society. So students can be assured of his credibility in his chosen painting medium. Peter believes in ‘actively’ teaching so his classes are full of critiques and advice, as well as analysis of established artists techniques and methods. He will demonstrate freely to explain a given method or technique but also believes that this information is there for the student to accept or disregard according to their own tastes and development. He has developed his own unique teaching style and methods that ensure the classes are entertaining, whilst serious in their pursuit of artistic progress for the student.